Since it's Where 2.0 and I'm not there, I'm vicariously taking part in the fun by showing how to prepare and publish paper maps for the web so they can be used in combination with some of the better-known street mapping services on the web, like Microsoft Virtual Earth or Google Maps. There are a few steps involved, including a really tedious stretch in the middle where you cross-reference points on your scanned map with known geographical locations so you can rubbersheet it into shape. There's a bit here that's similar to the Modest Maps AC Transit tutorial, but the idea with these maps is to match them to the same mercator projection quadtree tiling scheme used by all the popular online mapping services. Step one is to get a map. We've been finding our historical maps at the Online Archive of California, but the particular 1950's road map we added recently came from a flea market for $7. Any halfway decent flatbed scanner should get you a workable image. I scanned this one at about 600dpi in several pieces, and used Photoshop to stitch them together. I ended up with two 500MB+ TIFF images, one for pages 12-13 of the road map showing the bay shore of Oakland, the other for pages 14-15 showing the hilly bits. 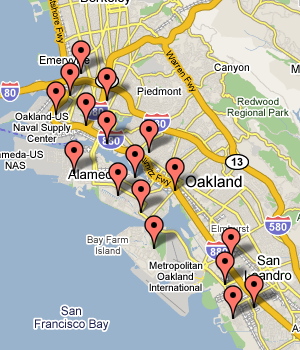 Each of those locations is noted along with its pixel position on the map image, e.g. the pixel at (x=184, y=202) corresponds to (37.831175 N, 122.285836 W). The parts that go "-gcp (x) (y) (lon) (lat)" are repeated for each of your reference points; I had 17 for one of the images. So that results in a VRT file, a chunk of XML that describes the geographic orientation of the image, without actually touching the image itself. Now you have a new TIFF file in a known projection suitable for slicing up into the 256x256 pixel square tiles used by Yahoo! 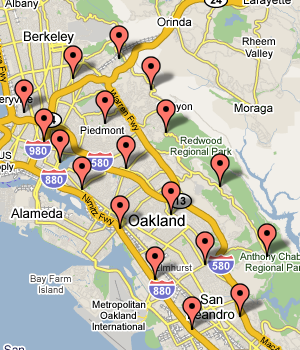 and Google and OpenStreetMap and Microsoft and everybody else doing maps online. In my case, I did the steps above for two separate images. The 1877 layer shows future plans for the dredging and widening of Oakland Harbor, before Alameda was an island and before the creation of Government a.k.a. Coast Guard Island. 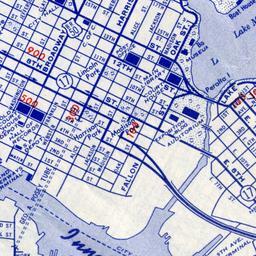 The parcel grids on the 1877 and 1912 maps extend right out into the bay. They knew what they were on about, these manifest destinarians. The 1912 map is principally about rail transport, and there's a ton of it. Rails everywhere that today aren't much more than uncomfortably-wide streets. The 1950's map was published by Standard Oil, and it makes almost no mention whatsoever of the rail travel options available in Oakland. This is especially ironic, given that SO was one of three companies (GM and Firestone were the others) convicted in 1949 of criminal conspiracy to destroy rail systems like the Key Route then operating in the East Bay. In the 1960's most of the rail routes were eventually dismantled, and we're just now starting to figure out how to make up for the loss. The 1950's map also has no freeways, and clicking back and forth between it and the present-day layer shows exactly which neighborhoods were cut through to introduce the 80, 880, 980, and 580 highways. Michal, this is fantastic! I've been working on some ideas for my own mapping stuff and this article helped answer some of my questions. 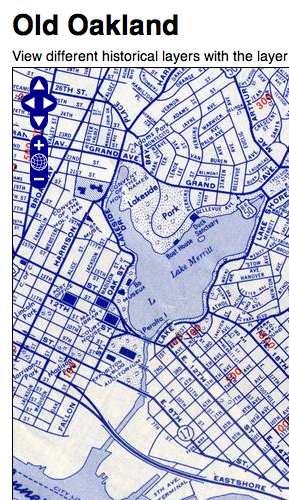 Also, I love the Oakland map showing the different time periods and also how topographers and city planners envisioned their cities. awesome post -- thanks for sharing this process! God, this makes me want to take a couple of weeks off and sharpen my technical skills to do this. I've run through this whole process enough times in photoshop to know how tedious it is to do by hand and how great it would be to have the whole thing on the web to play with anywhere. I love finding all the social/political angles embedded in these old maps, too. Been doing a lot of reasearch on dredging in the Baltimore Harbor, the maps from the late 19th c. here also show the grid extending. So, gauging interest - would it be useful if I were to set up a service that handled steps three and onwards? You'd scan a map, mark all the control points, and the rest of the reprojection and so on would be taken care of. I imagine there would be a tip jar of some sort.